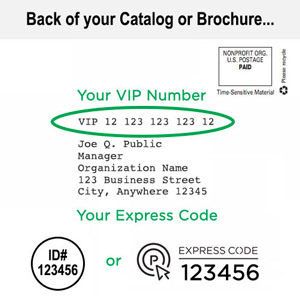 Have you recently been promoted to a new position as a manager or supervisor? Moving into a position of authority means meeting new challenges, taking on new responsibilities and mastering new skills. It also puts you in line for greater rewards at work — including positive recognition from peers and higher-ups, increased job satisfaction and better benefits. That's all well and good, but as a new supervisor, you may feel overwhelmed by all your new responsibilities, anxious about the transition and stressed out about moving from "coworker" to "boss." You may worry about the way others will react to your new supervisor status … have concerns about keeping up with a tougher workload … and wonder how to handle the new tasks you will be faced with: hiring, disciplinary action, even firing. 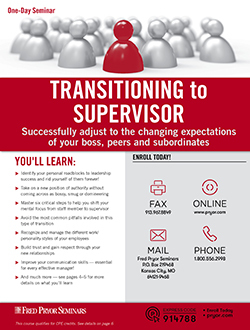 This new supervisor training was specifically designed to address the needs of anyone who is new to managing others. What you learn in this class will arm you with a powerful new set of skills, strategies and techniques for dealing with the issues you will encounter as you take on your new position and move forward in your career. You will find out how to relate well to former peers who are now your subordinates, and you'll learn the communication skills that will help you handle these changing relationships in a way that's comfortable for everyone. You'll discover secrets for motivating and encouraging people to do their "personal best" for you, and find out how to discipline firmly and fairly, without creating resentment. This supervisory training will not only show you how to positively influence the behavior of your employees, but also reveal ways to handle negative forces such as gossip, rumors and poor attitudes. … and put you on course for success! Ways to transition from coworker to authority figure without seeming domineering or "bossy"
Essential skills for building your own "dream team"
From buddy to boss - can we still be friends? Your old skills in your new job: which do you change and which do you keep? Ways to change your focus from "depth of knowledge" to "breadth of understanding"